This is a nice hike for those looking for something slightly beyond the traditional I-90 hikes. The six mile moderate level hike has some steep elevation gains in the beginning-- gaining over 2200 feet overall. But the views on a clear day are great and well worth it. Beware - the directions in some guide books are a bit too basic, see below for current signage/directions to the trailhead. Getting to this hike is slightly tricky since the directions in most books, including one of my favorites , are not current. There are a couple missing signs now, making the route a bit tricky, but not too hard to find. From Seattle take I-90 over Snoqualmie Pass to Exit 70, Turn left over the freeway and left again on the Frontage Road. Take the third Right on to Kachess Dam Rd (there was no helpful signs here other than the street name)-- if you pass a pond/lake on the right, you have gone too far. At about 1.0 mile look for the turn to the right (see below). Currently there is only a small red paper sign indicating this as the road to the trailhead for trails 1212 and 1315. The road to the trailhead can be narrow at times, full size SUVs might want to take it slow to avoid getting brush scrapes on the side. This trailhead has enough room for about 5-6 cars, its really just a large dirt turn around area at the end of the road. A Northwest Forest Pass is required to park here. The first mile of the hike is basically uphill with few breaks. The tree coverage is pretty good, so its almost all shade up the steep incline. The trail is fairly narrow, but in pretty good shape with newly created drain ditches built into the trail. Soon you will reach some vista points with views of the surrounding mountains including Mt Baldy, Domerie Peak and Easton Ridge. At about 1.0 mile you will reach a clearing with a branched off trail leading left. Stay to the right on the main trail. (The trail to the left takes you on a very exposed, steep scramble up to the beacon). After passing some more vista points, you will reach the Silver Creek area. The trail follows the Silver Creek for some distance. This area is fairly cool and protected from the sun -- even on sunny days. Once past some falls, the trail is mostly flat with slight uphills/downhills as it meanders along the creek. At 1.9 miles (it seems longer) and 3800 feet elevation, you reach the currently well marked Beacon Ridge trail junction. Take this trail to the left. Note - this trail itself is not maintained very well, there are a number of downed trees and overgrowth on the trail. Its somewhat easy to follow, but be sure to look ahead to make sure you are on the trail. After a couple switchbacks, this trail basically climbs uphill to the beacon for almost a mile. The trail is in the shade until you reach the peak of the ridge. At 4615 feet the Beacon Ridge trail suddenly opens up indicating you have reached the ridge top. At the top on a clearing is an old Air Traffic Control Beacon. I was lucky to enjoy a nice sunny clear day. The views can be fantastic at the top. 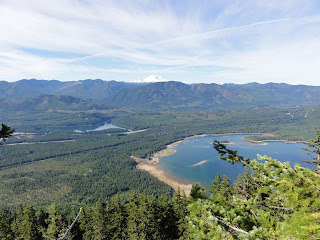 Views include Kachess Lake and even Mt Rainier (if you travel down the scramble route a bit). Return to the trailhead the way you came up. At over 6 miles, this hike might feel longer due to the consistent uphill at the beginning hike and the uphill portion of the Beacon Ridge trail. Note - my GPS route below shows from the Beacon back down to the trailhead. Trail - Out and back dirt trail, narrow in parts. Almost all in the shade. Horses and Mountain Bikes are allowed on the Kachess Ridge trail. Getting There - From Seattle, take I-90 east to exit 70. Turn left and cross over the freeway. Turn Left on the Frontage Road. Right on Kachess DM road, after about a mile look for another right to the traihead.